Homeopathic remedies will help treat a person with cellulitis symptoms, effectively - without antibiotics. Cellulitis is a bacterial infection of the skin. Bacteria get into the skin through a cut, scrape, or other wound. Cellulitis can also affect the deeper layers of connective tissue beneath your skin. In severe cases, it can also spread to the lymph nodes. Cellulitis most often affects the legs, but it may also affect the arms, face, and scalp. The affected area is red due to the inflammation and there may be warmth over it. Tight, glossy, "stretched" appearance of the skin is commonly seen. Pain or tenderness of the affected area is also seen. Other symptoms that may be seen include fever with or without chills, sweating, fatigue, muscle pains and malaise. Occasionally, local lymph nodes may be swollen. Most often cellulitis is caused streptococcus or staphylococcus aureus. These bacteria enter the body through a break in the skin including cuts, insect bites, burns, surgical incisions, IV catheters, dermatitis. MRSA (Methicillin-resistant staphylococcus aureua) infection is a more serious type of staph infection and is on the rise. Erysipelas is a type of cellulitis involving the lymph system. It is often preceded by an upper respiratory infections especially in infants, young children and the elderly. Erysipelas is generally caused by streptococcal infection. For cellulitis with great swelling of the affected area along with urning and stinging pains. Cellulitis burning pains are relieved by applying something cold over skin and the pains that rapidly shifts from one part to another. For cellulitis with a rosy hue of skin with great sensitivity to touch. Apis will cure cellulitis is a result of honey bee sting. 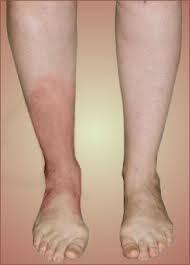 For cellulitis where the skin is very red and swollen with a shining appearance. Cellulitis pain is worse by touch. The pain is appears and disappears suddenly. For cellulitis is dryness of skin with much heat. For cellulitis resulting from insect bites. Coldness of affected part with tearing type of pains. Used in long standing cases of cellulitis in which the skin color changes from blueness to green. Used when small blisters are formed on skin in advanced cellulitis cases. These blisters can contain pus which is very offensive. Used when in cellulitis where there is fever with chilliness and offensive perspiration .